A couple of weeks ago, I was reading a review mag for the library and found a quilt book on "calendar quilts". 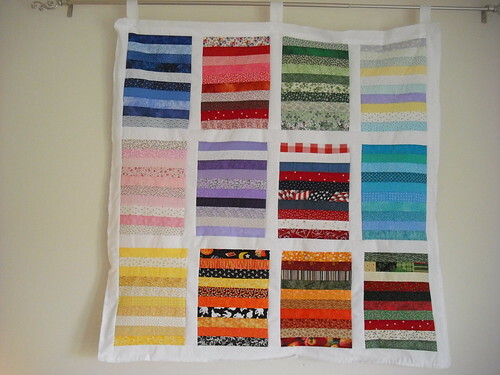 Being intrigued, I Googled the term and found more information about calendar quilts...namely, a challenge that encourages participants to piece a strip every day for 365 to represent a calendar year, and using seasonal colors and so forth. August: I just want to sink to the bottom of a swimming pool in August, hence the colours! I'm really pleased with the colour selections and how it turned out - done entirely while the Winter Olympics were on, even!